Update November 10, 2016: Bethesda have released some recommendations to help people overcome Dishonored 2’s performance issues. Arkane’s stealth sequel is suffering a spate of negative Steam reviews based on the game being a bit of a mess, technically. I’ve personally played around six hours and haven’t experienced any issues, so it seems purely anecdotal, though there’s clearly a split if you look at Steam. For the sake of clarity, I’m running it on a GTX 1070, 16GB RAM and an Intel Core i5 4440, at 1440p. 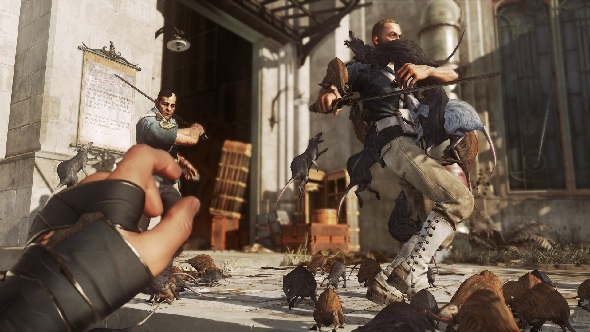 Angry at Dishonored 2’s performance but need a fix of emergent gameplay? Check out the best sandbox games on PC. If you’re one of the unlucky ones though, you might be looking for a fix. Hopefully some of these suggestions from Bethesda reduce any issues you might be having. Original Story November 10, 2016: It seems all is not well with Dishonored 2 on PC, with hundreds of negative reviews on Steam complaining of poor optimisation and performance. The top-rated commenter summarises his view as “poorly optimised release for an otherwise seemingly fantastic game”, which is fairly typical of the kind of comment you’ll see. The game is now sitting on a disappointing 62% rating, thanks almost entirely to technical issues. Common complaints include a big frame rate dip in busy areas within the city of Karnaca, blurry visuals and random spasms in mouse sensitivity. I read through a bunch of complaints to see if I could pick out any patterns, and while users with AMD cards or Nvidia GTX 970s seem to be having more trouble, there are posts from people with all kinds of rigs, up to and including GTX 1080s. And yet, for our part, it ran smooth on our test rig. With so many of you having problems, we updated our port review with a second test on a lower-spec machine, but could again find no significant issues – read about our experiences here. @Th3Frost3 @dishonored We're aware some PC players are having problems. We're investigating. Send details to @bethesdasupport. We’ll let you know if and when they or Bethesda release a more detailed statement.